Calories aren't bad for you. Your body needs calories for energy. But eating too many calories and not burning enough of them off through activity can lead to weight gain. 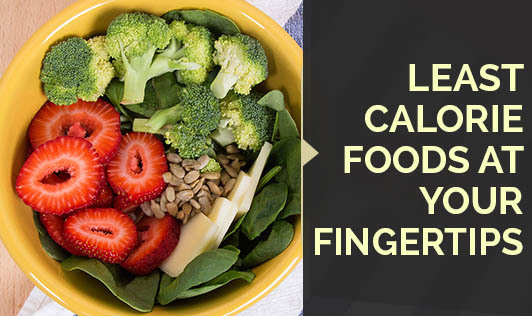 Here’s a list of foods known for their low calories, but proven for their health benefits. Don’t you have reason to use them? Herbs: Fresh or dried, herbs could actually help you lose weight. One clove of garlic can give your dish quite a makeover in terms of taste and has only 4 calories which is exactly the number of calories 10 sprigs of fresh parsley has. A teaspoon of powdered curry or cinnamon has about 6 calories, while both fresh and dried dill weed has 0 calories. Fruits: Fruits such as apricots, oranges, watermelons, lemons, peaches, raspberries, blueberries, strawberries and a few others definitely belong to the list of foods (when taken in limitation) with less calories. Apart from just being a weight-watchers saving grace, fruits are rich in anti-oxidants, fibre and loads of vitamins and minerals. Vegetables:Vegetables give your digestive system quite a workout and cause your body to burn more calories than you actually eat. Try carrots, cucumbers, turnips, broccoli, tomatoes, celery, radish, lettuce, cabbage, leek or spinach. Coffee: Coffee isn't exactly food but I just thought you'd like to know how surprisingly low in calories our favorite morning drink is. Yup, black coffee with no sugar, milk or cream has only 3 calories for 150ml and that's something you definitely need to remember next time you sit down for a cup of this drink. Coffee does have certain health benefits too when taken in the right quantities, but overdoing it can be harmful! Boiled egg whites: Egg whites, for most of us, is the tasty part of the egg. But, guess what? Egg whites also happen to be one of those yummy foods with least calories too! Yup, one hard-boiled egg white has less calories and that means you're allowed to eat one/two in a day and still stay within the low calorie range and get your dose of healthy proteins. Beans and lentils: Boiled beans and lentils have only 25 to 50 calories per serving. That means, if you use your creativity and cooking skills to prepare these with some fresh or dried herbs mentioned above, you'll have a great-tasting meal that also happens to be very low in calories. Feel free to add more, especially spices!